First-year architecture students at the 2016 Fall Interim, the quarterly exhibition organized by the Department of Architecture showcasing the “best of the best” student works from the preceding quarter. The undergraduate and graduate architecture programs at the College of Environmental Design have moved up in the latest national rankings. The Department of Architecture jumped to No. 12 nationally among all architecture schools, up from No. 19 in last year’s survey by DesignIntelligence, a highly respected survey of architecture employers across the country. 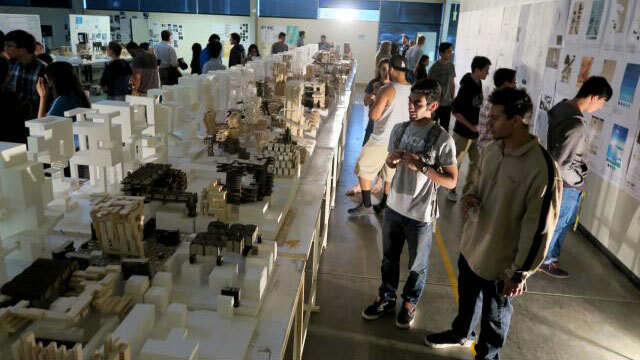 In a separate ranking of graduate programs, the Master of Interior Architecture programs – a joint program offered by Cal Poly Pomona’s Department of Architecture and College of the Extended University in partnership with UCLA Extension – rose to No. 8 this year, up from No. 10 last year. To learn more, go to DesignIntelligence at www.di.net.